"and I thought we didn't lose any family in the Holocaust...."
I was born in the United States in 1944 towards the end of World War II, so all that took place during that war was "pre-history for me." I grew up knowing nothing of any family in Europe or of a town called Yurburg (Jurbarkas) in Lithuania. I was under the impression that my family had been spared from any losses in the Holocaust. I thought that the Holocaust only happened to other "unfortunate families." Only when I started to ask some questions in the late 1960s did I find out otherwise. In the late summer of 1968, my sister and I decided that our grandfather, whom we all affectionately called "Pa" should take us out to a nice dinner before we returned to college in the fall. Without parental interference, we asked him about the old country and his family and started to draw a family tree. To our surprise, we learned that he and my grandmother each had brothers who had not come to America. Below their names on the tree, we wrote, "Large families lost during World War II.."
So it turned out that our family had not been spared! At that time we did not delve into the names of those lost cousins. Maybe it was because we were so overwhelmed by all the family connections and names that we were saturated. Pa had given us a family tree that went back to his grandfather, including all his aunts, uncles and first cousins. Families back then were huge and the town was fairly small. Pa also told us that his father, Sholom Eliashevitz, was the town flour miller, and our grandmother Celia Krelitz's family was one of the town's bakers. It wasn't until the early 1990s, when I was researching my family history, that I started to wonder about those families from Europe. I got my first computer in 1991, and one of the first pieces of software that I purchased was a genealogy program. I was determined to make some sense of that huge, confusing 1968 family tree. First I entered all the known names and incidental data. I then contacted and quizzed elderly relatives for information. When I returned to the old family tree, I wondered about the note, "Large families lost during World War II.."
Who were these people? What were their names? Had their memories been obliterated too? Why didn't I know about them? I started down a path of a series of events with incredible twists and turns and luck, which eventually gave me that information. One rainy Sunday in 1993, I ventured to the American Jewish Historical Society in Waltham to find out about the family town. I had a dim recollection of my recently deceased uncle mentioning the town of "Yurberik" in Lithuania, a town along a river. With that information, I examined a map of Lithuania but had no luck. However with the help of knowledgeable staff, I discovered that the town was called "Jurbarkas" in Lithuanian and appears on the maps with that name. It is located on the banks of the Neiman River to the west of Kaunus, then called "Kovno." 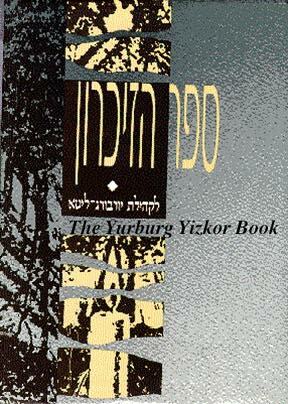 In Yiddish it was known as Yurberik or Yurburg. More help in my quest came in 1993 when an 86 year old cousin, Rosalin Krelitz, recalled that her mother had kept a Yiddish diary of a 1927 trip to Lithuania and Palestine. Telling her I would get the diary translated, I received it within a month. In its pages were two postcards and a photo of a cousin, Max Zarnitsky, who had immigrated to Palestine in 1927. 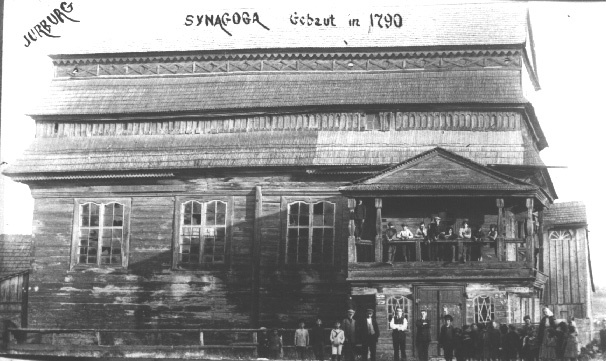 The postcards were of the very famous old wooden synagogue of Yurburg built in 1790 and destroyed along with the entire Jewish community of Yurburg in 1941, and a 1926 picture of the 1926 students in the Talmud Torah. The cousin also sent along an old photo of a handsome couple, with a note on the back, saying "To my dear Uncle and Aunt from your nephew, Moshe Krelitz." Neither my cousin nor I knew of a Moshe Krelitz; he was not on the family tree. 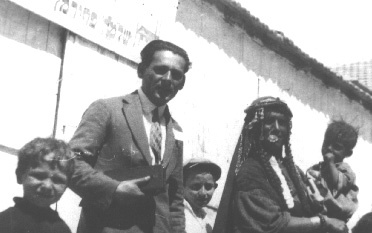 Photo of the Unknown Moshe Krelitz and his wife with the notation: "To my dear Uncle and Aunt from your nephew, Moshe Krelitz." The next break occurred when I asked Warren Blatt, whom I met at the Greater Boston Jewish Genealogical Society, for help in contacting research libraries using my newly acquired computer modem. After hearing of my interest in Yurburg in Lithuania, he immediately did an on-line search and found that the Yizkor (Memorial) Book of Yurburg had recently been obtained by the Library of Congress. With my new modem, I volunteered to host a Yurburg page on the JewishGen Shtetlinks Project to make public all the information I had found on the town. A few days later I called the Library of Congress, contacted the Yiddish and Hebrew section and learned the names of the book's publisher and authors: The Organization of Former Residents of Yurburg in Israel, a subgroup of The Immigrants from Lithuania in Israel. Incidentally, I had heard about this same book from a distant relative, Fay Schrage Ullmann, daughter of Helen Feinberg Schrage, originally from Yurburg. Fay said that her mother had a book about Yurburg that was so meaningful to her that she would never lend it out. Months later in 1993 as we were having dinner with Hadas Eyal, an Israeli friend, she offered to buy the book for me on her upcoming trip to Israel. After floundering for two weeks, I finally focused on the English-written List of Residents Abroad . I suddenly realized that this could be a resource for finding missing relatives.. After a few phone calls I reached Jack Cossid in Chicago. After reassuring him I wasn't selling anything. I asked if he were the Jack Cossid from Yurberik? He said "yes." I told him that my grandparents were from the town. Then to prove it, I asked him if the names Eliashevitz and Krelitz meant anything to him. He replied, "the flour miller and the bakers!" Bingo, we were connecting! I later learned that Jack was good friends with a first cousin of my mother, Moshe Krelitz (the same mysterious name on the post card). Jack had left Yurburg in 1937, just four years before the Jews of Yurburg were murdered. Jack was 19 when he left and, of course, Yurburg was his world. Four years later, that world was wiped off the face of the earth. Now more than fifty years later, Jack suddenly gets a phone call from a living relative of those people. He now had another connection to his past. 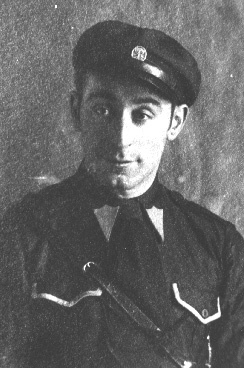 Moshe delayed his immigration to Palestine to marry; he never made it to Palestine and was murdered in his home town of Yurburg in June 1941. Later in the conversation, I mentioned a videotape that had been circulating in the family. A distant cousin, Ben Craine, had emigrated to the US around 1904, about the same time as my grandparents, and had become a successful photographer in Detroit. In 1927, he traveled back to his home in Yurburg with a 16 mm movie camera and took movies. They had been transferred on to videotape and copies were making their way across the country into homes of the relatives. I mentioned the 1927 film but got no response. Silence! Concerned, I asked Jack if he was still there. He replied that his back was full of goose bumps. Jack then told me that he remembered standing behind that photographer in 1927, and proceeded to describe scenes from the film. He was ten years old at the time, nearly 70 years before, and he remembered it in vivid detail. I found this hard to comprehend, but I knew it was true. It was an unbelievable scene. A few months later, I brought the videotape of the film to Jack's home in Chicago and showed it to him. He identified many of my relatives, and also his own brothers and sister, who later perished. I videotaped Jack's reactions as he watched the film. Jack was overwhelmed, as was I as I witnessed this event. Jack said that he now believed in miracles! I mentioned to Jack that two of my great-grandmothers were surnamed Naividel. Jack said that he knew of two Naividel brothers who were attorneys, Lushka and Mota. 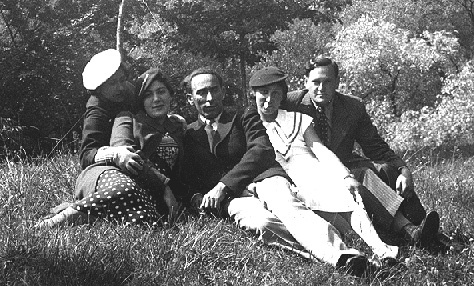 Jack remembered that Lushka had married Basia Meisler an ophthalmologist, and Mota had been engaged to a Karabelnik woman from Yurburg. Jack mentioned that there was also a sister who ran a variety store in Yurburg. The youngest brother, Reuven, ran a bicycle shop, and the youngest sister was the same age as Jack. 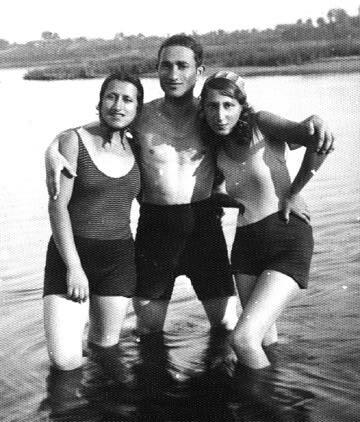 The two sisters and Reuven and their families were all killed in the Holocaust. 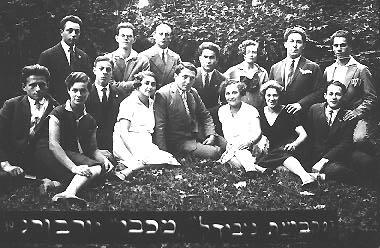 Before the war, a Maccabee social group was organized and named the "Kvuzat Naividel," meaning the Naividel Group. Jack had a picture of the group, including Lushka, in his photo album. I asked Jack what happened to them. He said that he did not hear about them after the war and therefore assumed that they had died during the war like so many of his friends and family. I have since maintained contact with Jack Cossid. A number of his photos, including one of the "Kvuzat Naividel"and the postcards mentioned above, appear in the Yurburg Home Page in ShtetLinks (URL given below). In May 1994, I traveled to Israel, toured the country and visited relatives. On the very last day of the trip, as I was talking to Shimon Shimonov of the Organization of Former Residents of Yurburg in Israel, I mentioned that my family names were Krelitz, Eliashevitz and Naividel. He interrupted me to say that there was a Naividel from Yurburg living in Tel Aviv! Thrilled with this information, I asked for his phone number. Later that afternoon, I called and spoke to Beny Naividel and explained that I thought that I might be his relative, although I had no record of any Beny Naividel in my research.. He replied that the only relatives that he knew of were his uncle's family. I told him that my great-great-grandfather was a Hillel Naividel from Yurburg. Beny answered excitedly and said that his uncle was named Hillel Naividel. I suggested that maybe we were indeed related and that maybe his uncle was named after my great-great grandfather. He wanted to meet me. I told him that we were leaving the next morning at 4 am for the airport and there was no time to see him. He insisted! So we arranged to meet at Itzhak (son of Max, who had come in 1927) Zarnitsky's home later that evening. We had maintained contact with our Zarnitsky cousins for over 70 years. When Beny arrived and we started to explore the possible connections, he said that his father, Mordechai, and Uncle Hillel were attorneys from Yurburg. I still made no connection. 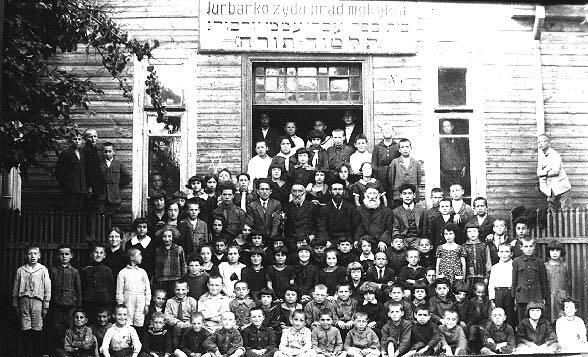 According to Beny, his Uncle Hillel, Hillel's wife Basia and their daughter Rachel, and his father Mordechai were in Kovno when the Nazis invaded Lithuania. They fled East with the Russian army and spent the war years in Uzbekistan, near the Chinese border. 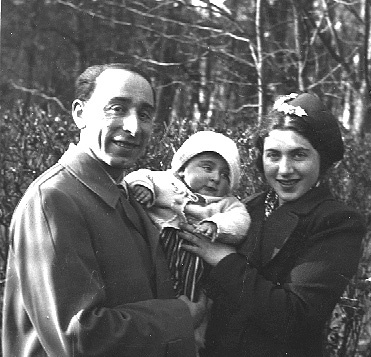 Mordechai's wife and a young daughter were in Yurburg and were killed in the first week of the war by the Nazis and their Lithuanian sympathizers. 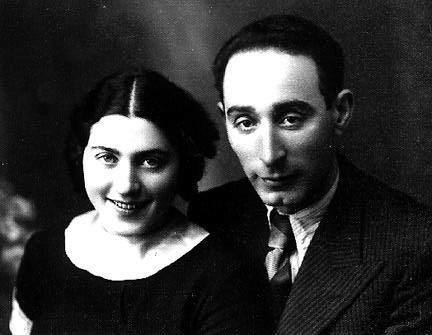 After the war, Mordechai and Hillel and his family returned to Lithuania and lived in Vilna. Hillel eventually became the President of the Supreme Court in Vilna and died in 1969 in Vilna in that capacity. After the war, Mordechai's attempt to reach Palestine was foiled by the KGB. He spent 8 years in prison as a result, a "Prisoner of Zion." In 1979, at age 76, he and his second wife and son Beny immigrated to Israel. Mordechai died in Ber-Sheva in 1993. This was the only family Beny knew. I then recalled my discussion with Jack Cossid about "Motta" and "Lushka" Naividel. When I mentioned this, Beny told me that "Motta" and "Lushka" are Yiddish nicknames for Mordechai and Hillel! Yitzhak, Beny and I were stunned. I suddenly felt that I was in one of those defining moments of life. I felt that my hairs were standing on their ends. Later I realized that my grandfather had given us the name of Beny's grandfather, Meir Eliezer Naividel, but not Hillel and Mordechai, who were born after my grandfather had left Yurburg in 1904, so he didn't know them. With Beny's confirmation that his grandfather's name was Meir Eliezer Naividel, we realized without doubt that we were cousins. This occurred in 1994, and we were cousins meeting after a ninety year separation of our families. It was truly remarkable. This connection is very meaningful to Beny, because he grew up with little family and always wanted a big one. Now he had one! After our short but exciting meeting that night in Tel Aviv, I corresponded with Beny and his wife Regina. Beny was starting a new business so he couldn't devote much time to the search for family, however Regina, who came from a very small family from Germany, caught the bug of "finding family." I mailed her my family information, which of course was based upon the family tree that my grandfather had dictated to us in 1968. Regina then managed to tap into the unofficial "underground" network of people from Yurburg that exists in Israel. She managed to add over 125 people to the family tree, including a whole branch that my grandfather had forgotten to mention. One day I received a 25 page typed letter from Regina documenting her finds. This research and her discoveries were beyond my wildest dreams. Clearly the people from Yurburg had remained in touch with each other, just as my grandfather's generation had when they came to this country. I had heard numerous stories of the members of that immigrant generation traveling throughout the US and contacting their "landsmen." The exodus from Yurburg to Israel was about 50 years more recent than my grandfather's exodus, so the ties were still alive. In fact, Beny had arrived just 15 years before, and there were cousins, like Gita Abramson Bereznizky and her sister Bella Abramson Kaplan (grand-daughters of Hillel Naivedel) who had arrived in Israel from Lithuania as recently as 1990. Regina's discoveries were beyond belief. We continue to correspond frequently. In fact, Regina helped obtain permission from the Organization of Former Residents of Yurburg in Israel to place the translations of the Yurburg Yizkor Book into this ShtetLinks home page. I had been told by my 86 year old cousin, Rosalin Krelitz that a very distant cousin Frank Rosen lived in Dallas and to the best of anyone's knowledge, had no children. I had no trace of him or his family. So I sent out a message on JEWISHGEN on the Internet and asked for help from Dallas in finding out about him. Jackie Ziff, answered my call for help. She researched the Dallas City Directory and found him in the 1930 and 1940 books. I then confirmed with Rosalin Krelitz that this indeed was him. End of story! ......Or so I thought. About two weeks later, I got an e-mail message from Jackie Ziff. She wrote that she had been having Shabbas dinner with friends who were longtime Dallas residents. So for some reason she asked if they had heard of Frank Rosen. Not only did they know of him, but the hostess turned out to be his niece and she related that Frank had a daughter and also a granddaughter. Since then I have met the granddaughter of Frank Rosen, Loyce Gender Weitz, who filled me in on that branch of the family. This eventually led me to a cousin Joseph Rosin, a survivor, who is retired in Haifa and is instrumental in documenting the history of the numerous Jewish Shtetlach in Lithuania on the JewishGen Shtetlinks project. http://www.shtetlinks.jewishgen.org/lithuania.html He co-authored with his good friend (they fought together with the Partisans) Professor Dov Levin of the Hebrew University, the most authoratative history of Lithuanian Jewry: Pinkas HaKehillot Lita, Encyclopeadia of Jewish Communities of Lithuania, 1996. Dear Joel, My name is Abraham Sherman and I am a nephew of Rivka Krelitz. I am originally from Mexico City but I am living in Houston, TX. My father is Max (Meyer) Sherman Krelitz, son of Leah Krelitz who was Rivka's sister. 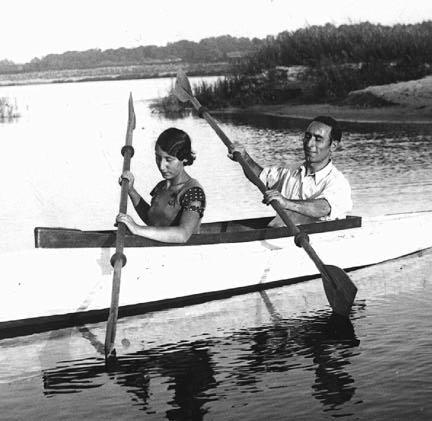 Leah went to Mexico City on vacation in 1937 to see Rivka and was told not return because of the situation in Europe. You cannot imagine his excitement in finding the same familiar photo of his grandparents family on the web. We have pictures of the whole family taken by Leah's brother Moshe Krelitz (now I knew who Moshe was) and even the letters in Yiddish in which my grandmother was told not to go return to Europe because of fear of future disaster. I have no idea why my grandmother does not appear in the list of the Krelitz family but I can tell you my father was totally overcome by emotion to find out he has other living relatives as he was told everybody died in the Holocaust. We never knew of family in the US. My father is fluent in English and both of us are sincerely looking forward to hearing from you. I have since exchanged visits with Max and other cousins in Mexico City, reestablishing the broken family connection after seventy years. The Yiddish letters, mentioned above were eventually translated into English by Jack Cossid; Jack was reading and translating letters written in 1938-1941 by his old friends, who had been murdered 55 years before describing the events in the long-gone town and describing their fears of a Nazi invasion. They knew what was in store for them. Jack was finding out what had happened to friends and cousins as if it had just happened from this precious time capsule. I now not only knew the names of our murdered cousins, but had read letters of their loves and fears and had photos of them and taken by Moshe Krelitz. My search was long and circuitous, but I now had answers to those first questions. And yes, we too lost family....but this knowledge and pain was lost in the years since. I have come to believe that there are similar sagas in most American Jewish families waiting to be discovered. One night on the phone, Jack told me that he had dreamed the night before that he was driving down a street in Chicago and saw all these long dead people and asked his dear friend Moshe how everyone was (knowing in the back of his mind that they had all been murdered). Moshe responded that "they were all well." Jack cried. I cried. The Internet, JewishGen and the ShtetLinks Project have certainly been most helpful in my search for my family and its roots. I am now convinced that there is yet more to come. The only question is where and how! Postscripts: With the generous help of family members and others sons and daughters of Yurburg, Regina Naividel and I have coordinated the translation of the whole Yurburg Yizkor Book, which is now available on the Internet on the JewishGen Yizkor Book Translation Project. I often receive questions from people who find the information on Yurburg on the Internet, looking for information about lost relatives from the town. I refer them to Jack Cossid, who spends hours on the phone reminiscing and telling them of their long-gone family. I have developed a deep love for Jack, this not-quite relative from Yurburg, who has brought to life again the memory of our long lost cousins.